Left? Right? Highway? County roads? Faster route? Scenic route? I have several ways that I can go to work and because I don’t like doing everything the same way each day, a lot of times I mix it up. A few days, I made the wrong decision and couldn’t wait to get to safer ground. It had rained a little bit through the night and with highway department trucks placing salt on the highway in front of my house, the roads looked fine. Left I decided. I pulled out of my driveway and turned left. But my car kept going left and the backend went right. Then I turned the steering wheel right and could gradually feel there was very little traction. I drove about 300 feet, turned around in the neighboring driveway and headed right back home to safety. Yesterday it seemed there was just a little snow on the roads so I decided to turn right. Then right again onto the county road. It seemed fine until I got to the point of not being able to turn around and it was a solid sheet of ice. All I wanted was to get to the point of safety and some traction. I finally reached the highway up ahead and made it safely to my destination. Throughout each day we have a lot of decisions to make. The devil draws us to ones that seem easy and the fastest way to what get what we want. We seem pulled in both directions. We may know the right route to take but the shortest path seems easier. We’re all about what’s easier or faster right? But sometimes God wants us to wait and take the longer route or the route that makes us depend fully on Him but we don’t like to wait or not exercise our independence. I know. I’ve been there. I am there. I’m tired of waiting on God to open doors. I’m anxious. He keeps telling me to hang on. Be patient. Enjoy the ride. But I am so tempted to do things my way and find ways that I think will open the door. It’s like driving on the icy, snow-covered roads. Which way do I go? The short cut or the longer way? Sometimes I take the icy route and can’t wait to turn around and head back to Jesus. It may take me longer to get there. But it will be the right way. I’m not sure what you’re going through today but I urge you to not be tempted by the devil’s schemes of the easy, faster way but rather to seek God for the perfect way. Because if we seek Him and follow His direction, we maintain traction and don’t get stuck on the devil’s slippery slope. Left? Right? Straight ahead? Nope. Look up. He’ll take you there. And if you choose the wrong route, don’t be afraid to stop and turn around and go back to Him. He’s wants to put you on the path with traction. Which way will you choose? Day 6 – Give a special treat to your mail carrier. Sunday was National Mail Carrier Day. Day 7 – Feb 7th is national send a card to a friend day. Choose a special card and a special friend. Day 8 – Buy a dozen donuts and drop off to your favorite business. Day 9 – Take some homemade muffins to your neighbor. Day 10 – Put $1.07 in a baggie with a note that says “buy yourself something on me today” and leave it in the toy section at the Dollar Tree. Day 11 – Give a hug to someone who looks like they need it! 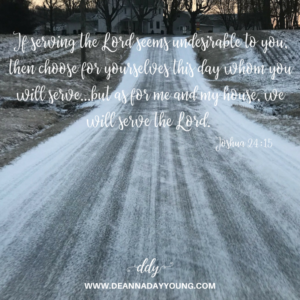 This entry was posted on February 6, 2018 with tags: #choosetherightpath, #jesusistheway, #makeadifferenceeveryday by Deanna Young.